West Ham blew the chance to haul themselves out of the Barclays Premier League drop zone on Tuesday night as Everton claimed a deserved 1-1 draw at Upton Park. The Hammers, who had climbed off the foot of the table thanks to Sunday's victory at Fulham, took the lead when Tony Hibbert diverted Radoslav Kovac's tame overhead kick into his own net. The visitors hit back three minutes before half-time through Seamus Coleman before Carlton Cole wasted a glorious opportunity to win it for the home side. After ending their 27-game wait for an away win in the league two days earlier, the Hammers were looking for back-to-back top-flight victories for the first time this season. But they were up against an Everton side who had won on their last four visits to Upton Park and had come away with a victory at table-topping Manchester City last time out. Curiously opting to play Tim Cahill as a lone frontman and leave three strikers on the bench, the visitors nevertheless went close to an early opener when Sylvain Distin ghosted in behind the Hammers defence but his touch took him too wide to shoot on target. West Ham, who rested Craven Cottage hero Cole, had enjoyed more than one slice of luck in that 3-1 win at Fulham and they got another to take a 16th-minute lead today. Tim Howard parried a James Tomkins header from a corner to Kovac, whose overhead kick looked harmless but took a huge deflection off Hibbert and into the net, instantly cranking up the noise levels at Upton Park. Distin blazed over and the fit-again Victor Obinna also drilled wide in what was a lively opening quarter from both sides. Although there were flashes of the defensive uncertainty that have dogged them this season West Ham started to boss proceedings, with Obinna their biggest threat. Matthew Upson headed over the on-loan Inter Milan forward's free-kick under real pressure. Everton began to get back into it and the home side suffered a blow when they were forced to replace injured left-back Herita Ilunga - playing for the first time in a month - with Jonathan Spector in the 34th minute. It proved costly as Everton equalised eight minutes later when Coleman got in behind the substitute to sidefoot home Cahill's far-post cross. Upson nodded a difficult chance off-target from a corner and Scott Parker sent a 25-yard chip narrowly over as West Ham tried to regain the initiative, while Coleman arced a stoppage-time effort wide. Fit-again Toffees midfielder Steven Pienaar brought a low-key start to the second half to life when he curled narrowly over in the 52nd minute. But neither side were able to impose themselves, and West Ham boss Avram Grant made his second change in the 56th minute when Cole came on for Frederic Piquionne. With Cahill ineffective as a makeshift striker, Everton finally brought on Ayegbeni Yakubu for Jack Rodwell just past the hour mark. Kovac picked up the game's first yellow card for fouling the increasingly influential Pienaar but both goalkeepers continued to prove mere spectators. That should have changed in the 70th minute when Obinna brilliantly sent Freddie Sears clear on the break and the winger's cross found Cole, who made a complete hash of his left-foot finish. Basic errors continued to flow from both sides but Everton had several chances in the space of three minutes to score a late winner. First Cahill steered Pienaar's cutback straight at Robert Green, Parker then produced a last-gasp tackle to thwart Yakubu before Green repelled Marouane Fellaini's bullet header from the resulting corner. 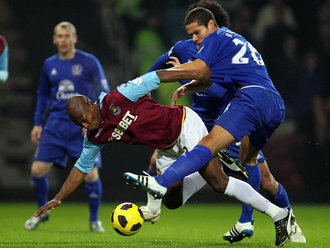 Cahill did then slide the ball into the net but he was well offside after being found by Yakubu's mishit scissors kick. Zavon Hines came on for Obinna for the final five minutes, Jermaine Beckford followed for Pienaar in the final minute and Diniyar Bilyaletdinov for Mikel Arteta in stoppage time. West Ham Green, Faubert, Tomkins, Upson, Ilunga (Spector 34), Sears, Parker, Kovac, Boa Morte, Obinna (Hines 85), Piquionne (Cole 56). Subs Not Used: Boffin, Reid, Barrera, Stanislas. Everton Howard, Neville, Hibbert, Distin, Baines, Coleman, Rodwell (Yakubu 62), Arteta (Bilyaletdinov 90), Fellaini, Pienaar (Beckford 90), Cahill. Subs Not Used: Mucha, Saha, Duffy, Baxter.